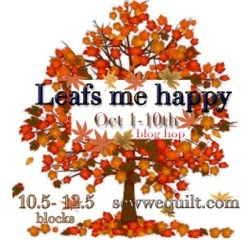 Quilting Lines: October Fun is Here! Oh yeah, back to the picture. 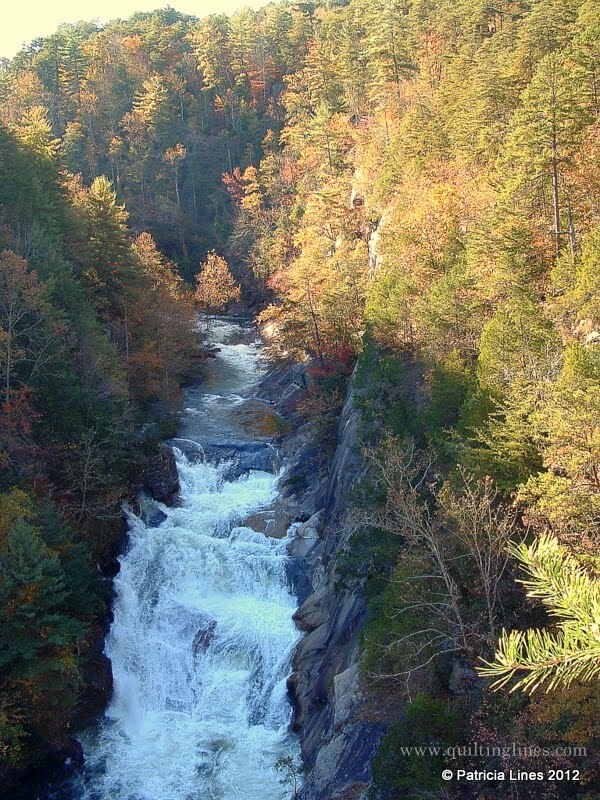 This was made at Tallulah Gorge State Park one beautiful fall day. It just so happened that it was a scheduled water release day and the river was full of kayaks too. Most of the time the water isn't fast enough or deep enough for them (none in this picture). This is going to be a very, very busy month for me! I have so many things to do that I can't wait to do. There are blog hops, birthdays, parties, trips, a wedding, new adventures, new designs, new tutorials and hopefully some quilting will get done along the way too! My calendar hasn't been this full in quite a while! Soma at Whims and Fancies has lined up designers to release a new paper pieced pattern that you can download EVERY DAY this month. You will find the first one at Ruthie Quilts! and quilts... I've seen a few that are coming and if you are a Halloween person you will be very happy with them! Cherry over at Cherry Blossoms Quilting Studio is the Cheerleader for Madame Sam this time. If you have ever been to her site you know what a classy hop she always produces. Now that's the start up news for the day, how about a finish up bit. I'd like to say a big THANK YOU! to all of you who came and visited my site during the last few weeks as a part of the Glorious Autumn Block Party. When I found the poem at the beginning of this post this morning I just had to use it. It reminded me so much of all the lovely comments that were left about favorite trees. Maples were a hands down winner. You should take a peek at them if you haven't read any. It will put you in the mood for Fall for sure. Congratulations to Deb #57, Lou #99 and Richard #68! Your prizes should arrive soon. AND what is your favorite post in my blog. If you have anything you'd like me to write about you can mention that too. New followers may participate. Giveaway closed October 7th. Winner will be announced Monday, October 8th. My favorite post is your Leafy Vase tutorial with ironing tips. The tutorial is what brought me to your blog (not sure from where) and I can use all the pressing tips I can get. I love the quotes you publish! Today's is especially nice! I love your tutorial and of course ,I`m a follower!! I follow you via Google Reader. Tutorials are always nice though I just enjoy reading about your projects. Thanks, Patricia. I am a follower on Google Friend Connect! :-) One of my favorite posts on your blog is the Leaf Vase Block Tutorial-- love those Fall leaves! I have to say, though, that this post is a close second-- because of the beautiful photo of Tallulah Gorge and the wonderful poem by George Cooper! I'm just getting started on my Third Weekend in October quilt-- and wouldn't that poem be perfect for the label!?!! :-) Thank you for the chance to win! I follow via google reader and like your newest blog post about "visually seamless" in fact I pined it for future reference. I hate seams in quilts, thanks for the tutorial. I think I found you with this post as I always love seeing other peoples sewing rooms! I find new blogs to follow off of One Pretty Thing, or other peeps' blog lists. Frankly, I don't know how I found you. I probably copied your address to my "add to" spot. Google+ or Google Friends doesn't always work for me. I don't know why. I follow your blog on Google reader and love your tutorials - especially the seamless seams one. Thanks so much for sharing your knowledge with us. I follow you blog with Google and I'm sure I'm going to enjoy your blog post as well as any tutorials. Thanks for sharing your talent. Hi!!! I am a new follower!!!! I had previously seen your glorious autumn blocks and came to see your posts for something wicked!!! Your blog looks like fun!!! Love the gorge pictures and all the fall leaves you have!!! I will be back for more fun!!! !